Afraid or not, Detective Bobbie Gentry has a monster to confront. The pain of losing her family and nearly her life to a criminal's vile hunger is still fresh, but now the landscape is different. Now she's not alone. Now she has Nick Shade to trust. Nick treats the terror of his past with vengeance. He's dedicated his life to hunting serial killers, and he'd give up his last breath to save Bobbie. When a string of killings bloodies Savannah's elite society and causes cold cases to resurface, Bobbie is captured in a city more haunted than Nick's inescapable nightmares. And as the murderer strikes close, Nick and Bobbie will need to become even closer if they're going to survive. 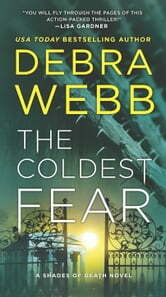 “Debra Webb is a master storyteller.” – Allison Brennan New York Times bestselling author.